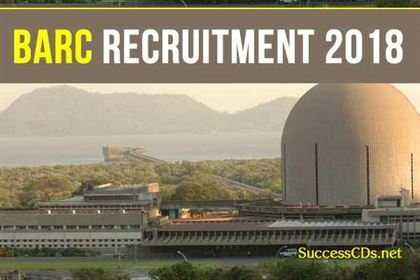 Check the complete details of the BARC Recruitment through GATE 2018 for OCES/DGFS like the application process, selection process, detailed eligibility, service bond, important dates and more below. I. Orientation Course for Engineering Graduates and Science Postgraduates (OCES-2018): This is a one-year programme conducted at the five BARC Training Schools situated at Mumbai, Kalpakkam, Indore and Hyderabad. c) Eligibility conditions for Chemistry Discipline (code 42): M.Sc. in Chemistry with Physics up to B.Sc. or at subsidiary and/or ancillary level in case of 5-year integrated M.Sc. and Mathematics at Std. XII or at B.Sc. or at subsidiary and / or ancillary level in case of 5-year integrated M.Sc., with a minimum of 60%aggregate marks in M.Sc. All candidates (other than those applying with a 5-year integrated M.Sc. degree) must additionally have a minimum of 60%* aggregate marks in B.Sc. Applicants opting to be considered on the basis of a GATE Score should have a valid GATE-2017 or GATE-2018 Score in ‘Chemistry’. d) Eligibility For Biosciences Discipline (code 43): M.Sc. in Agriculture, Biochemistry, Microbiology, Molecular Biology, Biotechnology, Genetics, Botany, Zoology, Plant Science, Plant Breeding, Plant Pathology, Entomology, Food Technology, Animal Science, Life Sciences, Biomedical Sciences and Biosciences with a minimum of 60%* aggregate marks in M.Sc. as well as in B.Sc. ; or B.E. / B.Tech/B.Sc.(Tech.) only in Food Technology with minimum of 60%* aggregate marks. M.Sc. applicants should have at least one out of Physics or Chemistry or Biochemistry or Agriculture Chemistry as a subject at the B.Sc. stage or at subsidiary and/or ancillary level in case of 5-year integrated M.Sc. Bioinformatics, and Home Science etc. and B.E. / B.Tech. / M.Tech. in Biotechnology / Genetic Engineering / Biomedical Engineering are not eligible. e) For Radiological Safety Eng. (RSE, code 44): B.E./BTech/B.Sc. (Engineering) / 5-year Integrated M Tech. in Nuclear Eng./Nuclear Technology /Nuclear Science & Technology with minimum of 60%* aggregate marks or M.Sc. in Physics or Chemistry with Physics and Chemistry up to B.Sc. or at subsidiary/or ancillary level in case of integrated M.Sc., Mathematics at Std. XII or at B.Sc. or at subsidiary and / or ancillary level in case of 5-year integrated M.Sc., with minimum of 60%* aggregate marks in M. Sc. All science candidates (other than those applying with a 5-year integrated M.Sc. degree) must additionally have a minimum of 60%* aggregate marks in B. Sc. All eligible candidates (other than those applying with a 5-year integrated M.Sc./ MTech degree) must have a minimum of 60%* aggregate marks in B. Sc. Additionally, eligible candidates must have passed Mathematics in Std. XII. All applicants opting to be considered on the basis of a GATE Score should have a valid GATE-2017 or GATE-2018 Score in ‘Geology and Geophysics’.